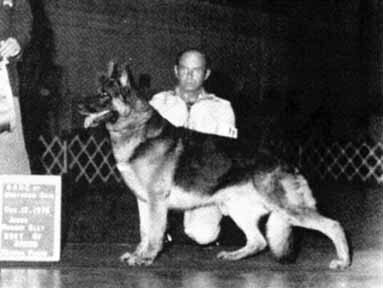 "Marty was a member of a three champion litter which also included Ch. Monty v. Bid-Scono, Ch. Mylanta v. Bid-Scono and Margo v. Bid-Scono, the 1973 Midwest Futurity and 1974 Midwest Maturity winner. Aloha died tragically while Marty was still a young puppy. The "M" litter was to be her only litter." "Marty began his show career in 1973 by winning his Futurity class under Ernest Loeb. He was not an early maturing youngster and was not shown again until the Fall of 1974. He began his adult career by winning the American Bred Class at the 1974 National under Ralph Roberts. He finished his championship in April, 1975 with five wins at large specialties." "Marty is a large male with beautiful type. He has a magnificent head with dark eyes, full dentition and correct bite. He is a dark black and red tan and carries a full working type coat. He is high withered, iron backed with a long sloping croup and very powerful hindquarter. He has excellent feet and black nails. Most important to us, however, Mary has a completely sound character. He is dry, hard and very agile. These are characteristics we have tried to stress in our breeding program." "At 13 1/2 years of age, Marty is still a healthy, happy German Shepherd Dog. He enjoys his ball, his romps, his biscuits and most of all his people. His eyes are not as bright but they still shine with devotion. His gait is not as powerful, but the will to do all we ask of him is as strong as ever. After all these years, the glory of the show ring has faded as it always does. What Mary represents to us will never fade. He is all the Bid-Scono has cherished in the German Shepherd Dog. We enjoy him while we may."